Our private concern is the health of humans in the third world. That is why we are constantly struggling for donated items for hospitals and orphanages. At our request the company Phillips was so generous and donated 7 ultrasound units and operating tables for local hospitals. One ultrasound machine was very much needed for a children’s hospital in the Outer Mongolia directed by a Catholic padres. 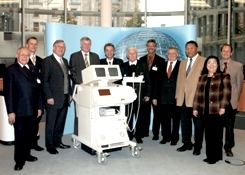 Then our team handed off an ultrasound machine for the Mongolian hospital in the German parliament together with representatives of Phillips, the former chairman of the committee on Economic Cooperation and Development, Mr. Rudolf Kraus. Also present were the former minister of Health and current Minister-President of Bavaria, Mr. Horst Seehofer, the Ambassador of Mongolia and the Mongolian children’s hospital director. If you want to help us by support further hospitals in the Third World with donated items, please contact us. We are grateful for any support. The suffering and misery in the Third World is growing. Help – each donation can save lives.